Our beautiful one bedroom condominium at Kamaole Sands is located on the 3rd floor in Bldg. 2 and features two bathrooms, a fully equipped kitchen, and an extra large (166 sq.ft.) private lanai which overlooks the pool and the fountain pond to the ocean. The lanai is perfect for breakfast or lunch, just reading on the chaise lounge or watching the sunset over the ocean. This lovely unit is decorated with mirrors, flowers, plants and beautiful paintings by local artists. It has a HDTV in the living room plus a 2nd tv in the bedroom, A/C, ceiling fans, DVD, and a stereo. All towels and linens are provided including beach towels. There is also a hair dryer. In addition to the king bed in the bedroom, there is a queen hide-a-bed in the living room. We also have a fold up floor bed that would accommodate a small child. There is a washer and dryer in the unit along with an iron and ironing board. Laundry soap is provided. Our kitchen includes electric stove, refrigerator, microwave, dishwasher, coffee maker, toaster, blender, etc. Unit is fully equipped with chinaware, glassware, silverware, pots, pans, cutlery, etc. Kamaole Sands has acres of luxuriant tropical gardens and private spots for picnics by the fountain pond. Swim in the large swimming pool or relax in one of the two jet spas. There is also a children's wading pool. Stroll along golden sand beaches just across the street and enjoy an ocean full of water sports including swimming, snorkeling and surfing. Shopping and restaurants are just minutes walking distance away. Kamaole Sands also offers four free tennis courts, gas BBQ grills, an Activity Center and complimentary parking. Free Wi-fi internet is in the unit. We also have a 2BR, 2 bath condo at Kamaole Sands in Bldg. 5 on the 3rd floor which overlooks the pool to the ocean. Rates for this unit are $159-$209/day depending on season and length of stay. For more information on this unit, please see my other listing on VRBO 185967. In addition to our condos at Kamaole Sands, we also own three 1 BR oceanview condos and a 2 BR oceanfront condo at the Maui Sunset Resort. For more information on these units, see vrbo #185950 for our 1 BR units and vrbo #223057 for our 2 BR unit. Resort Fee - the resort requires that all guests register at the office upon arrival. At that time you will receive a resort map, the combination for the pool and the side gates plus a parking slip for your reserved parking space #476. The Kamaole Sands office will charge you a resort fee of $35 (plus tax). 37 inch HDTV plus TV in bedroom. Beautiful unit, so cozy. The a/c was so wonderful, made the nights so comfortable! Questions were answered promptly too! Thank you for nite lights in bathroom, forgot to bring ours. Only wish lights outside window weren't so bright, hard to sleep. But then we like it,"bat cave dark". Haha! Everything about unit was great, otherwise. Thank you, Terry! Nice complex, unit is another story.. The grounds are quite nice. Re: the unit: It is not lovingly cared for by the owners. The AC is pretty jerry rigged, if it is on, you have to open the closet on the lanai, so then the hot air blows all over the lanai rendering it useless. Must turn AC off every four hours or it can overheat (safety warning). The vents in the bathrooms, ceiling fans and ac with layers of dust. Mattress is mush with quite a dip in the middle. No bath mat. Provided one towel each and had bleach stains and frayed edges. First condo ever where we were asked to do a load of towels and sheets in the laundry and dry it before we left....That didn't happen. We do pay a cleaning fee for a reason. First time ever I would not recommend staying at a rental. We are sorry to learn that you were disappointed with our 1 BR condo at Kamaole Sands. We just completed totally remodeling the kitchen and both bathrooms and had hired someone to deep clean it for us until we could get to Maui. I apologize if they missed cleaning some vents and fans. The A/C is also new and we will check it out. Regarding towels, our cleaner leaves four sets in each bathroom - two hanging up and two in a cabinet under each sink. We will be on Maui the last week in August and will purchase new towels as well as replace the mattress with a new king sized pillow top mattress. Because doing laundry is time consuming for our cleaning personnel we have asked our guests if time permits and it is convenient to do a load of towels. This is definitely not a requirement and we provide laundry detergent. You mentioned paying a cleaning fee. We did not charge you a cleaning fee. You paid $119 per night plus the Hawaii taxes of 13.416% for the four nights you stayed. The service charge you paid was a service fee which is charged by vrbo to make a reservation. Again, I am sorry our condo did not meet your expectations. Thank you Terry for helping rent this unit! Our first time staying in Kihei area. Property was beautiful. Only complaint we have not being able to stay as long as we wished. Very clean condo unit; would recommend to anyone and everyone. At the moment, we plan on returning to Maui next January. I see this unit is already spoken for during the dates we plan on being there ... bummer. I certainly hope we can contact you in the future for another stay. Thank you so much for the review. We are happy that you enjoyed your stay and look forward to having you as a guest in the future. This condo was so comfortable and had everything you could want from a fully equipped kitchen, washer and dryer, to beach chairs. I especially loved the large lanai with great views of the ocean, pool, and gardens. It is located on the inner courtyard so it does not overlook the parking lot- a definite plus! Kamaole Sands is my favorite place to stay in Maui. It is located on the most sunny and dry part of the island. 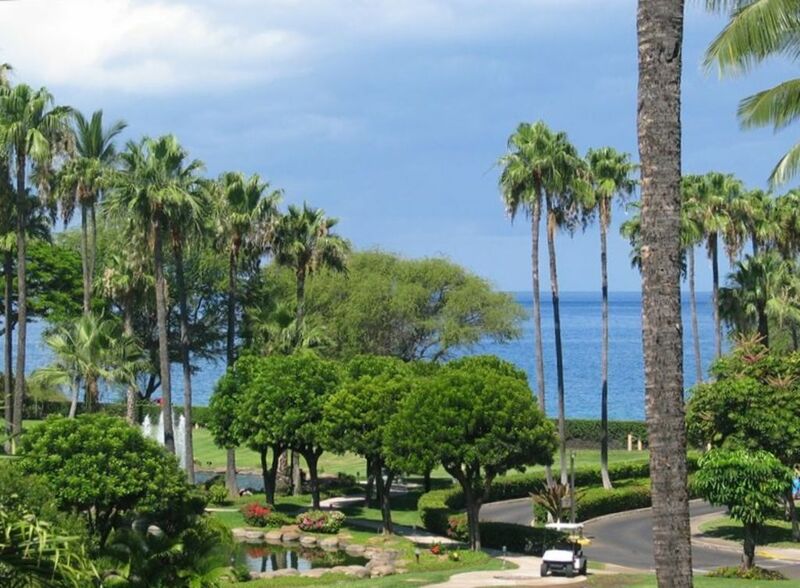 Very close to the best beaches, shopping in Wailea and Kihei, and restaurants ranging from five star to fast food. This resort has beautiful, well tended gardens, pool, hot tubs, children's waiting pool, and barbecues. Can't wait to come again! Thank you. I'm so glad you had a wonderful stay. We had a great time at Kamaole Sands. Room decor is dated, but room was large and well furnished including beach supplies. Kitchen was well stocked. Kamaole Sands is a very good condo in a good location. Would recommend. Only suggestion is that while the internet connection is good, a wifi would be more appropriate. A wired connection is not helpful when travelling with a tablet computer and as more and more people are going to be traveliing with tablets, wifi will becomore more of a requirement. We are continually updating our condos and just had new carpet installed. We have also upgraded the internet capability and now offer free wireless internet service in all our condos at Kamaole Sands and Maui Sunset. We appreciate any comments from our guests that will help us provide them a wonderful condo experience. Kamaole Sands Resort charges a $35 plus tax Resort Fee at time of registration. Additional $89 cleaning fee for stays less than 7 nights. Rates do not include 13.416% Hawaii GE/Lodging Taxes (HI Tax No. TA-187-452-8256-01 & GE-187-452-8256-01).